Alabama Theatre (Alabama Theater) / Birmingham - Early 1980s, Pentax lx, Sigma 16mm lens, tripod, 1 sec@f:4 on Kodak 5018 EKTACHROME 64T Professional (Tungsten) EPY - Polaroid / MicroTek SprintScan 120 slide scanner - Mirrored in PS CS3. The Alabama Theatre in Birmingham, Alabama, is a movie palace built in 1927 by the Paramount-Publix Corporation. Seating about 2500 people at the time, it was one of the larger movie theatres built in Birmingham and is the only one remaining of its size from that era. It was the first public building in Alabama to have air conditioning (Whitmire & Hanks 2002). Originally constructed to show silent films, the Alabama features a Wurlitzer theatre organ. In 1979, the Alabama was placed on the National Register of Historic Places. 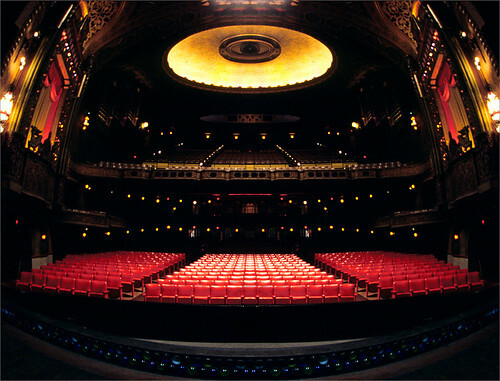 Today the Alabama Theatre is operated by Birmingham Landmarks, Inc., a non-profit corporation. The Alabama Theatre hosts numerous live shows and classic movie showings throughout the year.